Oman is an Arab state on the eastern coast of the Arabian peninsula. But what makes Oman special is that it is unlike any of the other Arab states. It is a civilization steeped in history and is the perfect blend of the modern and the traditional. It has,by far, the most heterogeneous culture among the Arab states. It is the land of Sindbad the sailor and has had cultural linkages with both East Africa and Persia since ancient times. It is these linkages and the enduring stamp that they have left on the Omani way of life, along with the Arab influence, that make Oman culturally richer and unique among its neighbours and peers in the Middle East. What helps matters further is that Oman is still unaffected by the rabid commercialization that is prevalent at most of the tourist places across the world. It offers a genuine peek, a pristine view, into the rich and unique sights and sounds that pervade through this ancient land. Rich culture isn’t the only attraction that Oman has to offer to a traveller. It is endowed with equally diverse geographical features that will delight the city worn traveller or the nature lover in you. From pristine beaches to a unique sand and gravel desert and from towering mountains to sink holes and ancient cave formations, Oman has it all! Whether you want your senses to be drowned in the cacophony of noises from a traditional Arab market or want to take a dip in one of the many pristine pools in the famous Wadis, Oman has it all covered for you. Wadis are dried river beds or valleys that criss-cross this ancient land. Driving on these sand and gravel river beds in a 4×4 SUV is an experience that I can’t wait to have. These drives take a traveller past villages and green oases where one can stop to rest. It is on these drives that one can embrace the ancient and pure core of Oman. 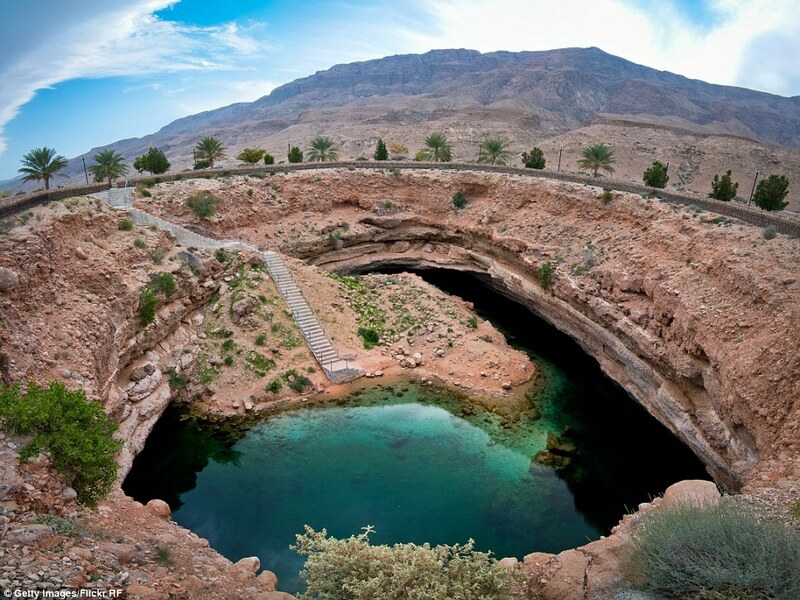 At about 100 km from Muscat, Wadi Shab is mostly a day trip. Think of an uninhabited oasis with pools of emerald green water and lined with lush palm trees and you have the most scenic picnic spot that nature can conjure up. If the day gets too hot a dip in these pristine pools is all you need to keep your cool. For the more adventurous kind, this is a cliff jumping heaven right in the middle of the desert! A visit to the land of Sindbad would be incomplete without a sail in a dhow ( a traditional sail boat). Sail past the pristine beaches off Khasab and revel in the freedom of the sea breeze. And if you are lucky enough, a pod of dolphins may decide to give you company. The coastline of Oman is littered with many tranquil beaches that provide a welcome reprieve from the desert heat and afford views of some of the most stunning sunsets you will ever catch. The one that is foremost in my list the “white beach” between Muscat and Sur. It also makes for an excellent camp site. White sand and turquoise blue water – what more can one ask for? Oman is home to over 400 forts and castles that are a testimony to the rich history that the Omanis can lay claim to. 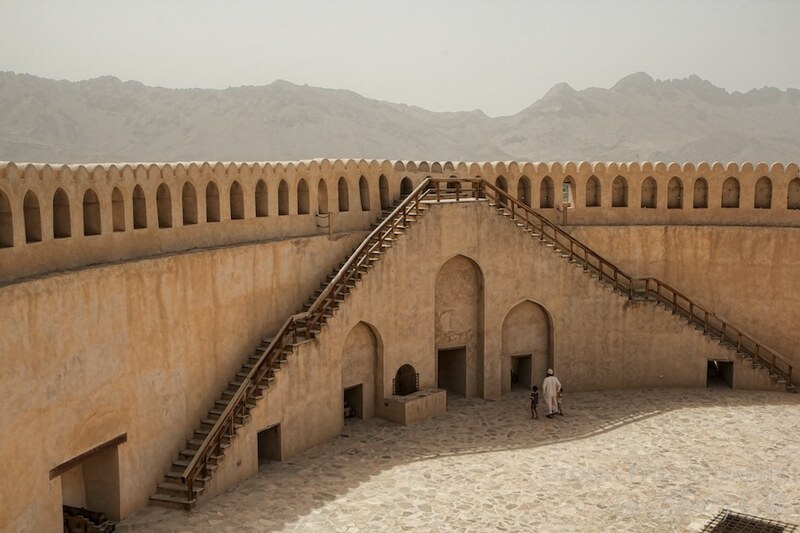 Fort Nizwa is the largest fort in the Arab peninsula and should be in the list of any traveller willing to dig deeper into the history behind the rich Omani culture. 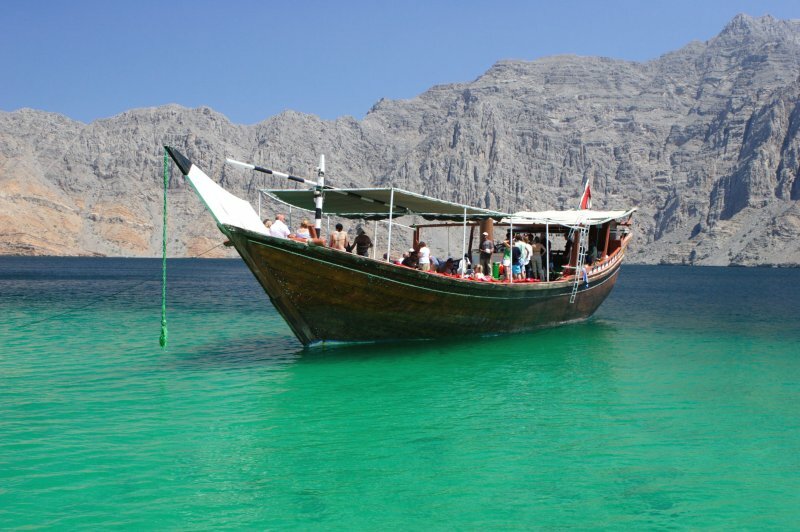 The oceans off Oman are a thriving marine ecosystem and extremely rich in marine life. Masirah island is a traveler’s best bet as up to four species of turtles (including the endangered Olive Ridleys) breed on the undisturbed beaches here. The tranquil environs and the mesmerizing beauty of the limestone sinkhole at Bimmah is a must visit for that picture perfect holiday postcard. The crystal clear waters of the pool invite anyone feeling the heat for a swim. Al-Hajar mountains is the highest mountain range in all of Arabian peninsula. These mountains also host a rich and diverse ecosystem unparalleled anywhere else in the region. From Arabian leopards to Arabian tahrs to the orynx, these mountains are the last sanctuary of many rare species. Must visit for any wildlife enthusiast. Oman’s unique geology has led to the creation of many rich and underground ecosystems like the Al Hoota cave. This cave has an underground lake and is easily accessible. Needless to say the presence of water has created a unique but thriving ecosystem. For more details on the exciting adventures and beautiful sights that await you there, please get in touch with Oman Tourism. This post is written as an entry to the IndiBlogger and Oman Tourism sponsored contest titled Beauty Has An Address. What a lovely post! I think it sums up some of the most interesting things about Oman, and any reader will definitely be wanderlustin’. I grew up in Oman, and I’ve enjoyed some of these experiences myself, but I’d love to go back for the rest and to see whether it feels any different from my now adult perspective! nice post on some of the best places in oman. Thanks Karthika. Glad you liked it! nice and real content. i liked it. Thank you Anita. Got lucky first time. Thrilled! This is such an awesome post on Oman! You have covered everything so precisely. All the best for the contest! Thanks Sangeeta. Glad you liked it! Very impressive elaboration of oman Beauty Abhigya , now come to oman i will fulfil your dreams to explore most of the places you mentioned in you Blog. Good its your quality Abhigya … Keep writing . Thanks Sumit. Encouraging comments like yours are a source of inspiration. Glad you liked the post. This is an excellent content about Oman.Loved reading between the lines and could imagine how great are the places on earth unexplored and unexploited.Kudos & Great Work! Thanks Raveesh. Glad you liked it!